The University of Strathclyde is Scotland's third-largest university by number of students, with students and staff from over 100 countries. The institution was awarded University of the Year 2012 and Entrepreneurial University of the year 2013 by Times Higher Education. The annual income of the institution for 2017–18 was £304.4 million of which £68.9 million was from research grants and contracts, with an expenditure of £304.0 million. Entry into many of the courses in the university is competitive and successful entrants in 2015 had an average of 480 UCAS points. It is also one of the 39 old universities in the UK comprising the distinctive second cluster of elite universities after Oxbridge. The university was founded in 1796 through the will of John Anderson, professor of Natural Philosophy at the University of Glasgow who left instructions and the majority of his estate to create a second university in Glasgow which would focus on "Useful Learning" – specialising in practical subjects – "for the good of mankind and the improvement of science, a place of useful learning". The University later named its city centre campus after him. In 1828, the institution was renamed Anderson's University, partially fulfilling Anderson's vision of two universities in the city of Glasgow. The name was changed in 1887, to reflect the fact that there was no legal authority for the use of the title of 'university'. 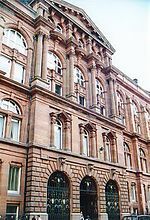 As a result, the Glasgow and West of Scotland Technical College was formed, becoming the Royal Technical College in 1912, and the Royal College of Science and Technology in 1956 concentrating on science and engineering teaching and research. Undergraduate students could qualify for degrees of the University of Glasgow or the equivalent Associate of the Royal College of Science and Technology (ARCST). Under Principal Samuel Curran, internationally respected nuclear physicist (and inventor of the scintillation counter), the Royal College gained University Status, receiving its Royal Charter to become The University of Strathclyde in 1964, merging with the Scottish College of Commerce at the same time. Contrary to popular belief, The University of Strathclyde was not created as a result of the Robbins Report – the decision to grant the Royal College university status had been made earlier in the 1960s but delayed as a result of Robbins Report. 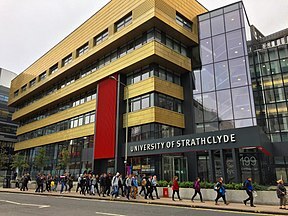 The University of Strathclyde was the UK's first technological university reflecting its history, teaching and research in technological education. In 1993, the University incorporated Jordanhill College of Education. The university has grown from approximately 4,000 full-time students in 1964 to over 20,000 students in 2003, when it celebrated the 100th anniversary of the laying of the foundation stone of the original Royal College building. In July 2015, Her Majesty The Queen opened the University of Strathclyde Technology and Innovation Centre (TIC). Since taking over the Jordanhill college in 1993, the University operated two campuses - The John Anderson Campus and the Jordanhill campus until 2012 when the Jordanhill campus was closed and everything was moved to the John Anderson Campus. The centrepiece building has long been the massive Royal College Building. Started in 1903 and completed in 1912, it was partially opened in 1910 and at the time was the largest educational building in Europe for technical education. Originally built as the Glasgow and West of Scotland Technical College Building, it now houses Bioscience, Chemistry, and Electronic and Electrical Engineering. The building is currently undergoing major internal renovation following the relocation of the Pharmacology and Bioscience departments to new accommodation in the John Arbuthnott (SIPBS) building, and the installation of a new heating system. The Livingstone Tower is a high rise building completed in 1965. It is home to departments including, Computer and Information Sciences and Mathematics and Statistics. Meanwhile, a new biomedical sciences building was opened in early 2010. It was designed by Shepparrd Robson, and aims to bring the multi-faceted disciplines of the Institute together under one roof. Sited on Cathedral Street in Glasgow, the 8,000 m2 building is the gateway to the University campus and city centre from the motorway. The James Weir Building has been reconstructed and reopened in 2014 after a serious fire resulted in many rooms being unusable. The Architecture Building, completed in 1967, was designed by Frank Fielden and Associates, Frank Fielden being the Professor of Architecture in the Architecture School at the time. In 2012, Historic Scotland granted Listed Building Status (grade B) to it, along with the Wolfson Building designed by Morris and Steedman Architects. 2012 also saw the 20th Century Society select the Architecture Building as their 'Building of the Month' for September due to its cultural significance and enduring appeal. The University of Strathclyde Centre for Sports, Health and Wellbeing is a leisure facility undergoing construction situated adjacent to 100 Cathedral Street. Construction began in November 2016 and is due to be completed in Summer 2018. The Andersonian Library is the principal library of the University of Strathclyde. Established in 1796, it is one of the largest of its type in Scotland. It is situated in the Curran building. Situated over 5 floors at present, the Andersonian Library has more than 2,000 reader places, 450 computer places and extensive wi-fi zones for laptop use. It has around one million print volumes as well as access to over 540,000 electronic books, 239 databases and over 38,000 e-journals that can be used 24/7 from any suitably enabled computer. The archives are divided into 3 as follows. 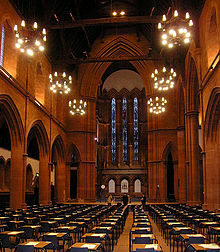 The official records of the University of Strathclyde from 1796 to the present day. Includes the records of the University's predecessor institutions as well as the papers of many former staff and students and associated organisations. A diverse range of archives which have been acquired by gift or deposit to support the University's teaching and research. Rare or significant printed material and books, including the Anderson Collection (the personal library of John Anderson, 1726-1796, natural philosopher), plus over 30 other collections spanning the 16th to the 21st centuries. The University of Strathclyde Technology and Innovation Centre is a centre for technological research. The construction of this centre began in March 2012 and was completed in March 2015. The nine-storey, steel-framed building can accommodate around 1200 workers from numerous fields, including engineering, researching and project management. It includes open plan space for offices, three lecture theatres and areas for specialist laboratory equipment. The project secured a £6.7 million funding from the European Regional Development Fund and another £26 million from the Scottish Government. The university itself supplied the other £57 million needed to reach its £89 million budget needed to create the centre. In addition to the Technology and Innovation Centre, a 5000m2 Industry Engagement Building is located adjacent to the TIC building. Research carried out in the Technology and Innovation Centre is in the fields of: Advanced Engineering and Manufacturing, Advanced Science and Technology, Bionanotechnology, Business Engagement, Continuous Manufacturing and Crystallisation (CMAC), Energy, Health Technologies at Strathclyde, Human and Social Aspects of Technology, Photonics and Sensors, and Asset Management. The TIC hosts the UK's first Fraunhofer research centre, the Fraunhofer Centre for Applied Photonics and TIC also plays a major role in Scotland's International Technology and Renewable Energy Zone (ITREZ). The university delivered teaching to 22,955 full-time and part-time students in 2016/17: 15,590 undergraduates and 7,365 postgraduates. Another 34,000 people take part in continuing education and professional development programmes. The university's main campus, John Anderson Campus, is located in the centre of Glasgow, near George Square. Till 2012, the University operated an education campus in the suburb of Jordanhill, at the site of the previous Jordanhill Teacher Training College which it disposed off and relocated to a new building in the John Anderson Campus. In January 2012, The University's Court also endorsed the recommendation of the Estates Steering Group that Strathclyde moves to a single campus by disposing of the entire Jordanhill site and constructing a new building for the Faculty of Education on the John Anderson campus. Strathclyde is the only Scottish university that offers the IET Power Academy engineering scholarships to its engineering students. Strathclyde is particularly renowned for engineering and has various engineering departments under the Faculty of Engineering. Strathclyde was ranked 37th in the UK for the quality (GPA) of its research in the 2014 Research Excellence Framework, a rise of 13 places from the 2008 Research Assessment Exercise. The university is highly ranked among the top 10 in the UK in various subjects according to the Complete University Guide 2019, namely being 1st for Accounting & Finance; 1st for Aural & Oral Sciences; 1st for Communication & Media Studies; 1st for Pharmacology and Pharmacy; 1st for Social Policy; 1st for Medical Technology; 1st for Hospitality, Leisure, Recreation & Tourism; 2nd for Marketing; 2nd for Forensic Science; 5th for Architecture; 6th for Business & Management Studies; 6th for Electrical & Electronic Engineering; 7th for Chemical Engineering; 8th for Civil Engineering; 8th for General Engineering and 9th for Mechanical Engineering. QS World University Rankings 2018 placed the university among the top 25 internationally for Hospitality & Leisure Management, 51-100 for Pharmacy, 51-100 for Business & Management, 101-150 for Electrical & Electronic Engineering, 101-150 for Architecture, 101-150 for Education, 151-200 for Accounting & Finance, 151-200 for Law, 151-200 for Civil & Structural Engineering, 151-200 for Mechanical Engineering, 201-250 for Chemical Engineering, 201-250 for Physics and Astronomy, 251-300 for Sociology, 251-300 for Economics, 251-300 for Materials Sciences, 301-350 for Mathematics and 301-350 for Computer Science & Information Systems. The University is one of the 39 old universities in the UK comprising the distinctive Cluster Two of elite universities after Oxbridge. 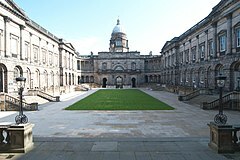 A detailed study published in 2015 by Vikki Boliver has shown among the Old universities, Oxford and Cambridge emerge as an elite tier, whereas the remaining 22 Russell Group universities are undifferentiated from 17 other Old universities (including the University of Strathclyde) which form the second cluster. In 2011 the University's Advanced Forming Research Centre was announced as a leading partner in the first UK-wide Technology Strategy Board Catapult Centre. The Government also announced that the University is to lead the UK-wide EPSRC Centre for Innovative Manufacturing in Continuous Manufacturing and Crystallisation. The University has become the base for the first Fraunhofer Centre to be established in the UK. Fraunhofer Gesellschaft, Europe's largest organisation for contract research, is creating the new Fraunhofer Centre for Applied Photonics in collaboration with Strathclyde, for research in sectors including healthcare, security, energy and transport. Strathclyde was chosen in 2012 as the exclusive European partner university for South Korea's global research and commercialisation programme – the Global Industry-Academia Cooperation Programme, funded by South Korea's Ministry of Knowledge and Economics. In 2012 the University became a key partner in its second UK Catapult Centre. Plans for the Catapult Centre for Offshore Renewable Energy were announced at Strathclyde by Business Secretary Vince Cable. The University has also become a partner in the Industrial Doctorate Centre for Offshore Renewable Energy, which is one of 11 doctoral centres at Strathclyde. Engineers at the University are leading the €4 million, Europe-wide Stardust project, a research-based training network investigating the removal of space debris and the deflection of asteroids. Strathclyde has become part of the new ESRC Enterprise Research Centre, a £2.9 million venture generating world-class research to help stimulate growth for small and medium-sized enterprises. The University has centres in pharmacy, drug delivery and development, micro and ultrasonic engineering, biophotonics and photonics, biomedical engineering, medical devices, new therapies,prosthetics and orthotics, public health history, law, crime and justice and social work. The University is involved in 11 partnerships with other universities through the Scottish Funding Councils’ Research Pooling Programme, covering areas such as engineering, life sciences, energy, marine science and technology, physics, chemistry, computer sciences and economics. Several Strathclyde staff have been elected to Fellowships in the Royal Societies of Edinburgh and London. There are around 15,000 undergraduate students out of which almost 4,000 are mature students who start their studies after gaining experience in the workplace, and almost 16% are overseas students from more than 100 countries around the world. Around 7,000 students are undertaking postgraduate studies at Strathclyde. There are approximately 45,000 students studying part-time in the university each year, either in the evenings and weekends or through distance learning. The university also has an alumni population of over 100,000 and growing. Alumni of Strathclyde and its predecessors (the Andersonian Institute and the Royal College of Science and Technology) include the scientists; John Logie Baird, inventor of the first working television; Henry Faulds, physician, missionary and scientist who developed of fingerprinting; James Young, chemist best known for his method of distilling paraffin from coal and oil shales. In politics: Tasmina Ahmed-Sheikh, MP for Ochil and South Perthshire; Willie Coffey, MSP for Kilmarnock and Irvine Valley. In business: John Barton, Chairman of Next plc and EasyJet; Sir Thomas Hunter, Entrepreneur and Philanthropist; Jim McColl, Scotland's richest man; Alastair Storey, chairman and CEO of Westbury Street Holdings; and Andrew Wyllie, civil engineer, CEO of the Costain Group and president of the Institution of Civil Engineers. Academics associated with the university include; James Blyth, generated electrical power from wind; Sir Samuel Curran, inventor of the Scintillation counter; Thomas Graham, chemist who formulated the law of diffusion of gases; Andrew Ure, physician and founder of Andersonian Institution; Matthew Charteris, taught Medicine at Anderson's from 1876 to 1880. ^ a b c "Financial Statements 2017-18" (PDF). Strathclyde University. Retrieved 19 January 2019. ^ a b c d e "Universities: Profiles: University of Strathclyde". Complete University Guide. Retrieved 18 March 2015. ^ Previous winners :: THE Awards 2013. The-awards.co.uk. Retrieved on 2013-08-12. ^ a b "Are there distinctive clusters of higher and lower status universities in the UK?" (PDF). Oxford Review of Education. 41: 608–627. doi:10.1080/03054985.2015.1082905. ^ a b "Most Russell Group universities 'little different to other pre-92s'". 18 November 2015. ^ "University of Strathclyde in Glasgow, Physics Department - Historical Laboratory Photos". Phys.strath.ac.uk. Archived from the original on 16 July 2012. Retrieved 14 July 2012. ^ "Samuel Curran". Oxforddnb.com. Retrieved 14 July 2012. ^ Strathclyde University School of Architecture — The Twentieth Century Society. C20society.org.uk. Retrieved on 2013-08-12. ^ BBC. "Plans approved for £33m Strathclyde University fitness centre", BBC News, Glasgow, 22 August 2016. Retrieved on 8 November 2016. ^ "Using the Library". University of Strathclyde. Retrieved 26 July 2014. ^ "Archives and Special Collections". University of Strathclyde. Retrieved 26 July 2014. ^ "Strathclyde University technology hub secures £89m in European funding". BBC News. 11 June 2012. Retrieved 29 July 2014. ^ "Green Light for £89m Technology and Innovation Centre". "Glasgow City Council". ^ "Research Themes". "University of Strathclyde". Archived from the original on 26 April 2012. Retrieved 29 December 2013. ^ "IET Power Academy- IET Conferences". Theiet.org. 10 July 2012. Archived from the original on 8 September 2009. Retrieved 14 July 2012. ^ "University of Strathclyde". Retrieved 22 December 2018. ^ "QS World University Rankings by Subject 2018". Top Universities. Retrieved 22 December 2018. ^ European Consortium of Innovative Universities Archived 5 November 2013 at the Wayback Machine. Eciu.web.ua.pt. Retrieved on 2013-08-12. ^ A diverse Student Population Archived 30 December 2013 at the Wayback Machine. Strath.ac.uk. Retrieved on 2013-12-29. ^ a b c d e f It All Started Here - University of Strathclyde Archived 8 September 2012 at the Wayback Machine. Strath.ac.uk. Retrieved on 2013-08-12. ^ "Celebrity-toppling Alastair Storey sees catering trade as table laden with opportunity". www.scotsman.com. ^ "Andrew Wyllie Receives CBE In New Year's Honours". Costain. Retrieved 24 January 2019. ^ Nguyen, Anh. "Costain CEO Andrew Wyllie becomes the 154th president of ICE". Institution of Civil Engineers. Retrieved 24 January 2019. ^ Biography ~ Sir Samuel Curran. Purbeckradar.org.uk. Retrieved on 2013-08-12. Wikimedia Commons has media related to University of Strathclyde.